Since Mr. Rock Out tagged me, and the last time I ever got to post a personal article was a Side Rant on the Ragnarok Cosplay of Sohee, I decided to first feature a cosplay of a character I most relate to: Souma Yuki. Just like Hatori and Momiji, Yuki is a member of the 13 cursed Souma family members. His sign is the Rat’s, and he is very popular in his school, giving him the title of “Prince”. And I really like this cosplay… Too bad this Yuki is a girl. I tend to take the blame for everything. I think it’s something inborn, so, if something goes wrong, even with the universe sake, I can’t help but think I’m somewhat responsible for it. I hardly ever go out. Why? My parents are so strict they almost didn’t let me work, haha! (actually, it’s not laughing matter, because it’s true) I am working right now, but the catch with this agreement is that I can’t go to company outings and stuff. Funny, because my parents let me go to business trips outside the country. I have an “I don’t care” attitude, but I cry a lot. When I’m angry, depressed, or whatever extreme emotion you can think of, I get teary. So even the 1st Pokemon Movie got me crying when Pikachu was trying to revive a petrified Ash Ketchum. I am extremely over-protective… Also an inborn trait. So if something happens to my colleagues, I would usually either a. take tge blame for it; or b. start a war to show how much we were wronged. I believe the world revolves around money. It may not be able to buy you happiness, but it buys you everything else. People tend to look highly of the rich, and they are “untouchable”. Yzak Joule is one of the elite pilots of ZAFT in the series Gundam Seed and Gundam Seed Destiny. In Gundam Seed, he was under the command of Rau Le Creuset, leader of the prestigious ZAFT Le Creuset special operations team. He is very proud of his elite status, and considers Athrun Zala to be his primary rival. This character may not be at the top of my favorite characters’ list, but it’s hard to deny how awesome this cosplay is. To explain why this cosplayer is covering his/her right eye, it’s because in the series, Kira Yamato gave him a scar in one of the battles they fought in. Technically, it’s on on his right eye, but above it, and across his face, but it makes sense to people who’ve seen the series. First, I have to say… This girl looks like the same cosplayer as Felicia of Darkstalkers. Makes me curious to know who she really is… But I unfortunately have no leads.If anyone can point me in the right direction, I’m all ears! Anyway, Aerith, the flower girl of Final Fantasy VII who turned out to be the one who can summon the only force capable of repelling the ultimate destructive magic handled by Sephiroth known as “Meteor”. She unfortunately perishes in the game, but most Final Fantasy VII fans still see her as an icon of the series. That weapon she’s holding look like it’s really made out of marble. Awesome job with this cosplay! An interesting video clip of Kelly Osbourne cosplaying Lacus Clyne from Gundam Seed… Her hair clip is on the wrong side but you pretty much know she’s doing Lacus anyway. Enjoy the clip! Don’t mind the first 2 slides… I was just testing the video uploader thing in Sanriotown. Technically, this is the 5th Rikku I’m posting on this blog. But I didn’t label the post that way because she is the first Rikku I found who cosplayed the X version rather than the more popular X-2 versions. Rikku is perky and optimistic. She has a close friendship with Tidus, as they are quite similar in their personalities. Since she is an Al Bhed, she suffered discrimination from the Yevonites, but this didn’t change her positive outlook in life. She did whatever she could do to save Yuna from giving her life with the Final Summoning. I think I like this costume of Rikku’s more than the X-2 ones… I’m not entirely sure why that it. But I think a lot of people will disagree with me on this. This is probably one of the best cosplays I’ve ever come across! Then again, I tend to say that about all the cosplays I feature here don’t I? Watanuki Kimihiro is an ordinary student in an ordinary world… But he has a secret. He can see ghosts, demons, and spirits! He meets Ichihara Yuuko, a time and space witch, who claims to have to ability to grant any wish, for a price! And what price does Watanuki have to pay to grant his wish to never see spirits again? Work in Yuuko’s shop as a part-time job, which includes cooking, cleaning and other household chores! 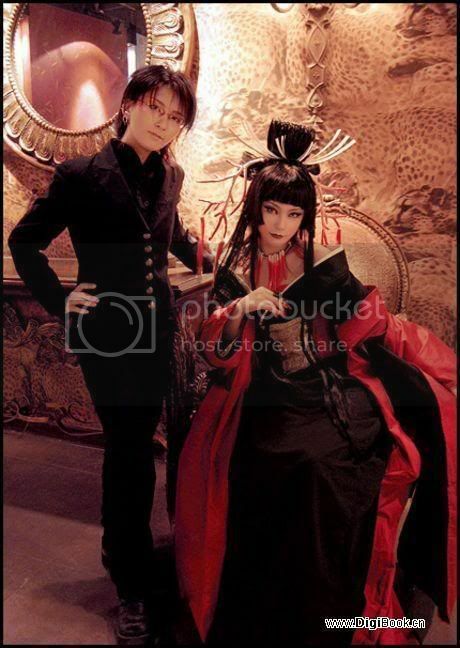 I really love Yuuko in this picture… Watanuki as well! Thanks to DigiBook for sharing this picture! People who only watched the anime of Fruits Basket will argue that Akito should be cosplayed by a guy, but the manga reveals that she is actually a girl! I was pretty shocked when I read it… She probably doesn’t want to be a girl because she despises them, saying that they are sneaky creatures that seduce the male Juunishi away from her. The reason why she is basically the head of the Souma Clan since she is considered to be the Jade Emperor, the ruler of the 12 signs of the Chinese Zodiac, so her word is absolute. She’s also very sickly, and the anime mentioned she only has 30 years to live, though I’ve never seen that in the manga. You are currently browsing the Nanao’s Cosplay Research weblog archives for January, 2008.